Yellow Spot (~€80) is brought to us by Mitchell & Son, the Dublin based wine and spirit merchant, via the Midleton distillery. Mitchell & Son, established in 1805, are Ireland's sole surviving wine and spirit merchant. Green Spot was their first resurrected brand which has many fans the world over. Like Green Spot, the recently launched Yellow Spot is also an Irish Single Pot Still whiskey, made from the uniquely Irish mash-bill of malted and unmalted barley. But there, the similarities end. While Green Spot contains 7-9 year old whiskey, the youngest whiskey in Yellow Spot is 12 years old. Yellow Spot isn't further aging of Green Spot, it's a different beast altogether. The spiciness of the pot still style dominates in the Green Spot. 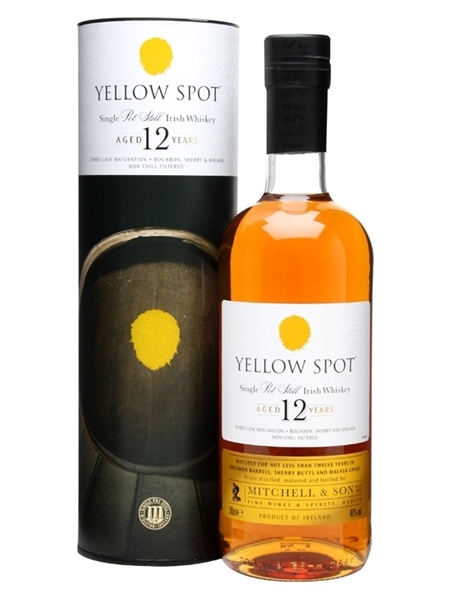 Yellow Spot, on the other hand takes significant influence from its Malaga cask maturation. This sweet, fortified wine gives this whiskey a fanatastic balance of sweet and light, pot still style. It's bottled at 46% ABV.